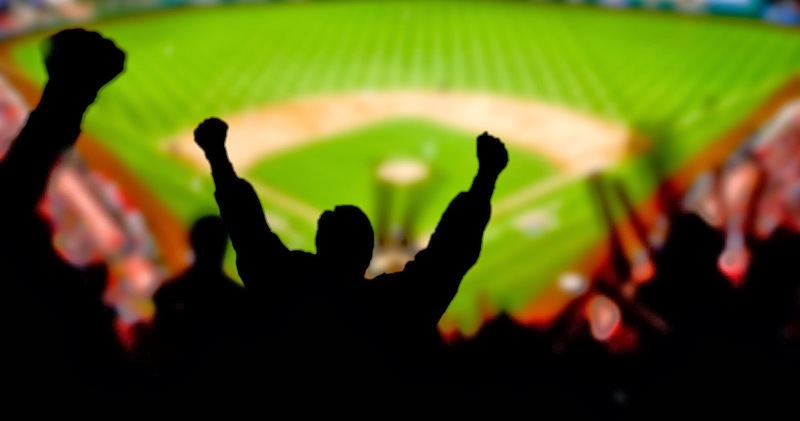 The Fat Pitch: Has US Debt Reached A Tipping Point? Has US Debt Reached A Tipping Point? Summary: Investors have become very concerned about excessive debt in the US. The worry is that current leverage has risen so rapidly and become so extreme that the economy is at imminent risk of a crisis. Is this concern valid? In this post, we break US debt into its main components: government, corporate and household. We compare each to their historical levels to determine whether current leverage levels have previously led to adversity. More importantly, we assess whether current leverage levels for each are sustainable. 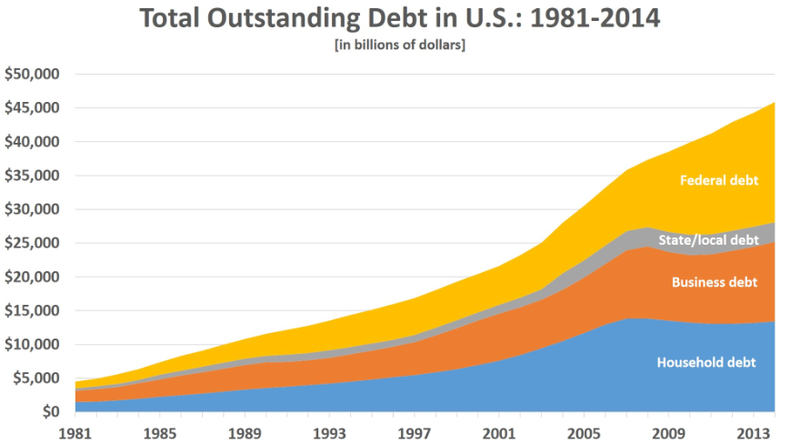 The rise in US debt is primarily due to the federal government and corporates. Objectively, it is hard to see the case for either being a worrisome risk at present: their liabilities and interest expenses can be covered many times over by assets and income. Moreover, households have deleveraged during the current cycle. This is quite unlike other periods of economic expansion. Given the importance of consumer spending to overall economic growth, current consumer debt levels are likely to be more of a tailwind for the economy than an impending risk. There is a good chance that you have seen a picture of US debt like this one. It compares total US debt, held by the government, corporations and households, to the US economy. 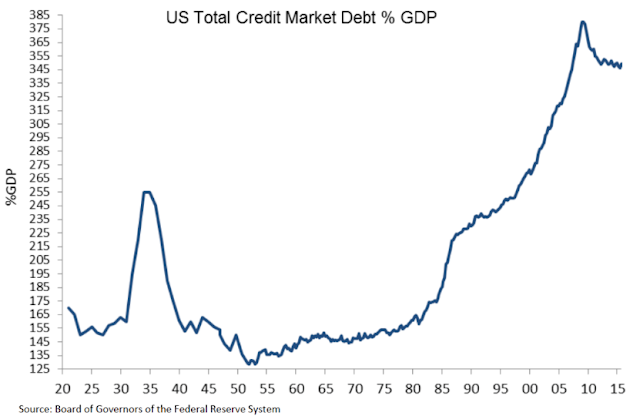 By this view, total US debt is very high by historical standards and has grown too rapidly. Enlarge any chart by clicking on it (chart from the Federal Reserve). The natural human tendency is to think of debt as bad, that by incurring debt we are living beyond our means. That may feel especially true in the wake of the Great Recession, which was in part the result of some excessive leverage. All else equal, most would prefer low leverage: this implies easier debt servicing (risk) and the ability to assume greater debt in the future to fund consumption. 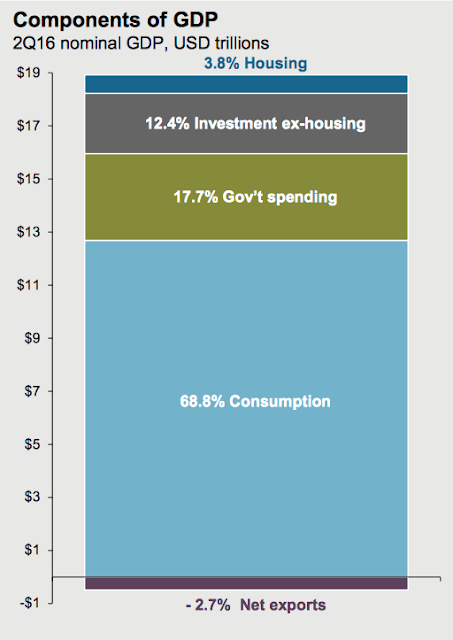 In contrast, higher debt implies consumption must be funded mostly through savings, cash flow or disposable income. So, does current US debt on its own pose a risk to future consumption? To answer that question, it is best to look at each of the components of total debt: government, corporate and households. Why? Because doing so allows us to see where leverage may be excessive and where it is probably not. For background, about half of total US debt is federal and roughly a quarter each is corporate and household. State and local debt is relatively minor (chart from mybudget360.com). Let's start with federal debt which, given its size, receives the most media attention. To simplify, federal debt is the accumulation of annual budget deficits which in turn result from spending in excess of tax revenue. In the US, federal debt is now equal to about 100% of GDP (chart from Just Facts). Is that level of debt excessive? Certainly, the current level of federal debt is high relative to US history. 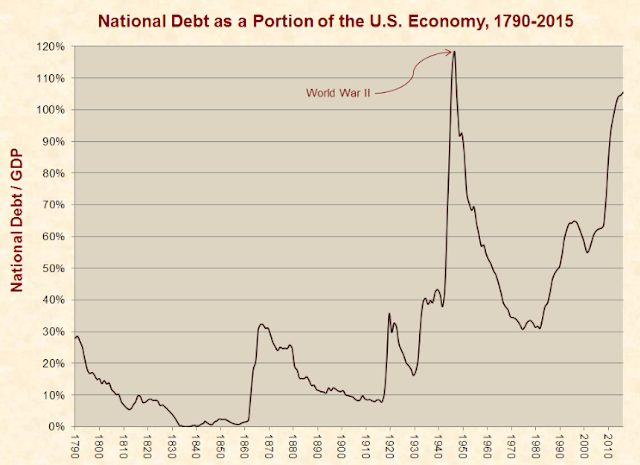 In over 220 years, only the funding of WWII pushed relative federal debt to a higher level. US federal debt/GDP is not high relative to other advanced economies. On balance, it is very similar to Europe. Australia, Switzerland and the Nordic countries have the lowest relative debt. 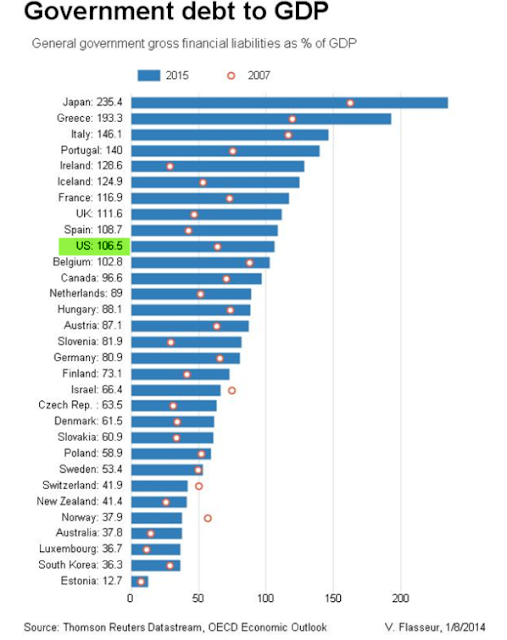 Japan has the highest (chart from the OECD). 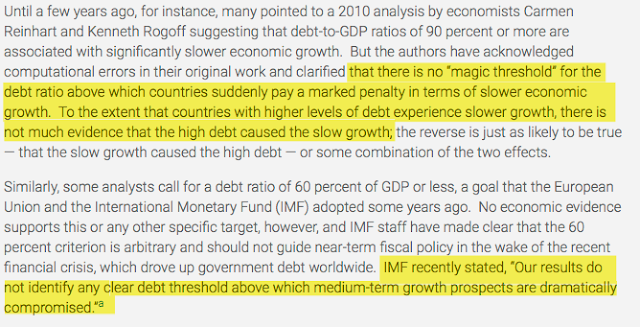 An alternative way of looking at this is to calculate a country's "fiscal space," the difference between its current debt/GDP and an upper threshold where default risk becomes meaningful. On this measure, too, the US's current debt/GDP is not exceptional (read further here; chart from The Economist). 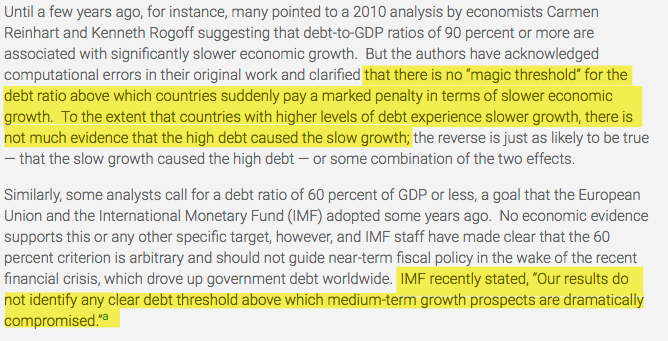 It's notable that high federal debt/GDP, on it's own, does not imply lower future economic growth. Let's look at some historical examples. There have been two spikes in British debt since 1700 in which the country's debt/GDP grew to over 200%, more than twice that of the US's today (first chart; from Huffington Post). In the following decade, GDP grew 30% in both instances (second chart). It would be easy to pass off the long period after the spike higher in US debt/GDP in the mid-1940s as being mostly about population growth, but growth in this period was relentlessly strong on a real per capita basis. 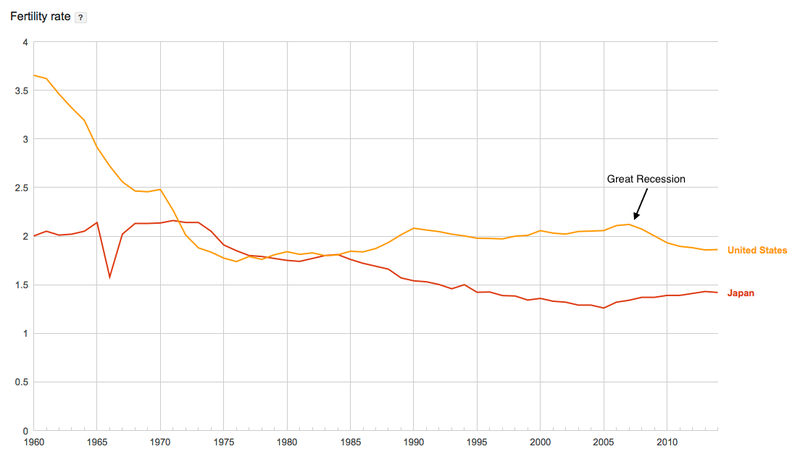 More recently, Italy's debt/GDP crossed over 100% in 1992; in the next decade, Italy's real GDP grew 17%. 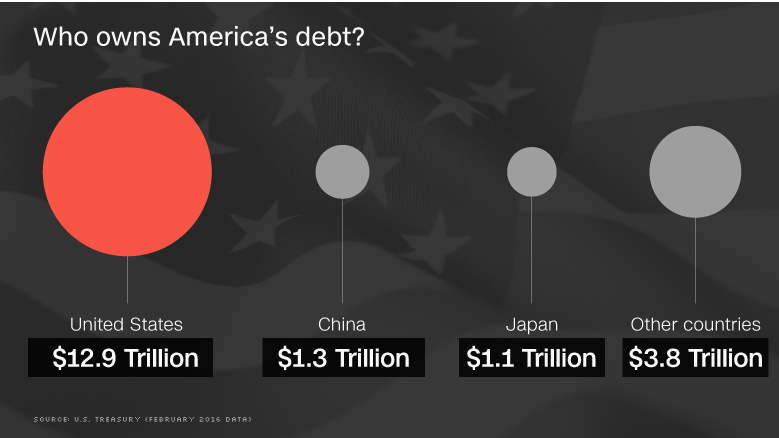 Japan has the highest federal debt/GDP in the developed world. That ratio crossed over 100% in 1996 (arrow). In the next decade, Japan's real GDP grew 11%. That's not strong growth, but it comes within the context of Japan's well known aging population. 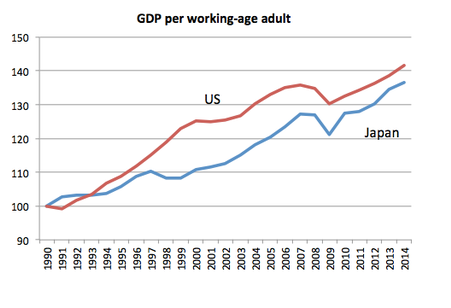 In fact, if you look at the growth in Japan's GDP relative to its working age population, it looks very similar to the US over the past 25 years and has in fact been growing faster than the US since 2000 (chart from NYT). What the examples above show is that federal debt/GDP higher than that faced by the US today has not on its own led to a disaster. Economies kept growing, even if at the slow rate reflected in their working age population. That conclusion has been further validated by academic research (quote from CBPP). Why is this? While comparing debt to GDP is a convenient benchmark, the measure itself doesn't say much about whether debt is unsustainably high. Assessing whether there is too much leverage is usually better done in two ways: first, by assessing the ability of assets to cover liabilities, and second, by assessing the ability of income to cover interest payments. Let's look at each of these. For all the hand wringing about high federal debt, the interest cost of that debt is very small. As a share of GDP, it is just 1.2%. This is as low as during the halcyon days of Eisenhower and Elvis. 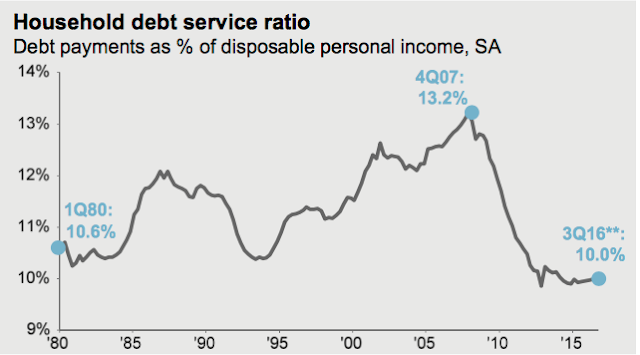 Debt servicing is not consuming a substantial portion of our national income. It was nearly 3 times higher when Bill Clinton took office. There was no pressure on other parts of our federal budget due to higher interest costs then, and there is certainly none now. Interest coverage is a non-issue. Debt relative to the assets of the US is also very low. The Institute for Energy Research estimates that oil and gas reserves are worth more than 8 times the amount of total federal debt. Coal assets alone are worth more than the total debt. Add in the value of other US assets like land (the federal government owns 30% of all land in the US) and structures and the total dwarfs the size of the federal debt. On this measure. the US is barely leveraged at all. In this respect, the US is quite different from other countries (like Japan) that lack the deep natural resources of the US. Read more here. It is true that the federal debt increased substantially during the Great Recession. That is what happens when tax revenues fall but non-discretionary expenses (like retirement and health insurance) do not. Once tax revenues recovered, the debt/GDP ratio stabilized. In 2015, the debt/GDP ratio in the US declined. Looking ahead, if GDP growth continues to be greater than interest costs plus new deficits, then the debt/GDP ratio will decline further. That is what has historically happened in the US (and elsewhere). Right now, that seems quite likely. The US government can borrow for 10 years at a negative real interest rate; in comparison, real GDP growth was 2.9% in 3Q2016 (chart from JPM). What is unrealistic is to assume a future with both a marked increase in interest rates and slow GDP growth; these are incongruous. 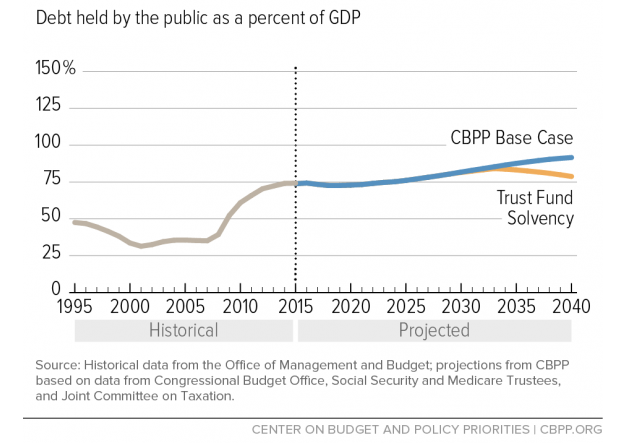 On realistic assumptions, the nonpartisan Center on Budget and Policy Priorities expects the debt/GDP ratio to remain stable over the next decade. Read further here (chart from CBPP). In summary, while US federal debt/GDP has grown over the past 30+ years, leverage ratios are not high and there is no empirical evidence suggesting current debt on its own is a risk to future growth. Again, the natural human tendency is to prefer that debt was lower as it means greater flexibility to fund growth in the future. We are in that camp as well. But, objectively, it is hard to see the case for current federal debt being a worrisome risk at present. Before moving on, we'll briefly address several misunderstandings about federal debt. First, federal debt is not like household debt. Members of a household eventually die and their debts must be settled. The federal government is inanimate. Consequently, unlike household debt, federal debt does not have to be repaid. For most of the past 220 years, the US government has maintained a growing balance of debt. It is not suddenly our children's responsibility to pay back the $20 trillion in federal debt that has accumulated since the 18th century (read further here and here). Second, federal debt is not impoverishing the nation. Why? Because federal debt (a liability) is also an asset. Your savings account likely includes government bonds that pay valuable interest from which you benefit. So, in the aggregate, spending by one party is balanced by the savings of another party. To put it another way, federal debt is "money we owe ourselves." Moreover, foreign ownership of America's debt is relatively small (read further here; chart from Money). Third, it's not clear that the US is on the path to becoming a stagnant population of retirees like Japan, where the burden for servicing federal debt falls on a dwindling number of working taxpayers. In the US, the very large millennial generation is entering its prime reproductive years (first chart, from Calculated Risk). 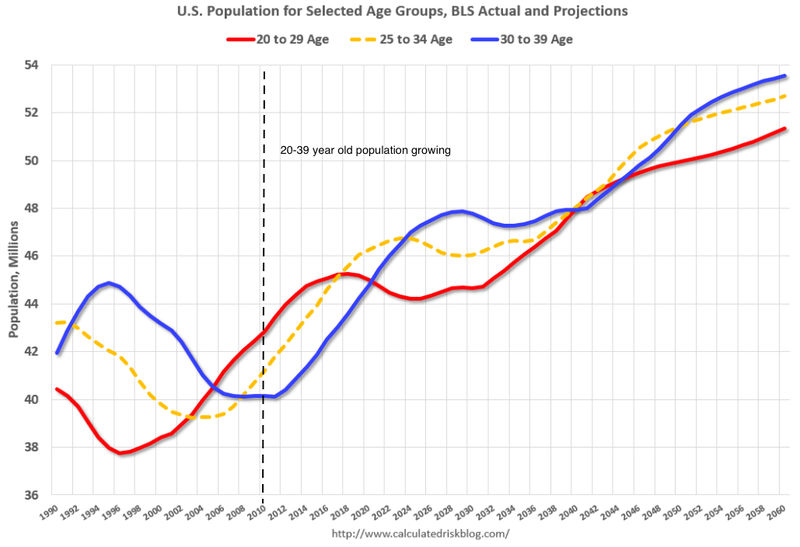 Meanwhile, reproduction by those who waited until their 30s and/or the passing of the Great Recession may be beginning. The US fertility rate stopped falling in the 1970s and has been trending slightly higher since, but was clearly affected by the Great Recession (second chart). A growing, working, spending and taxable population erodes federal debt/GDP over time (read further here and here). Finally, the US is not becoming Greece. What has happened in Greece has almost no applicability to the US. 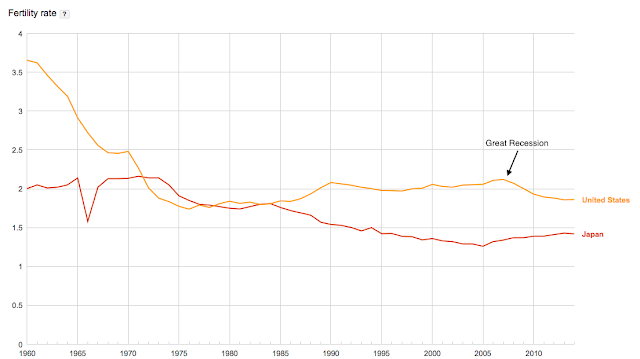 Greek federal debt/GDP crossed over 100% in 1993 (first chart); in the following decade, the economy boomed, growing nearly 50% in real terms (second chart). The country was in the process of harmonizing for inclusion in the Euro currency: it's high inflation rate rate fell and the yield on 10-year government bonds dropped from over 25% to 5% (third chart, from Quartz). During this time, Greek debt/GDP stayed stable near 100%, a level that existed right up until the eve of the Great Recession. The subsequent crisis had little to do with high and spiraling federal debt on its own. Greece lacked an independent currency to adjust to the fall in demand, the rise in unemployment and the country's relatively poor labor productivity. It also lacked the fiscal autonomy with which to stabilize the drop in private demand. 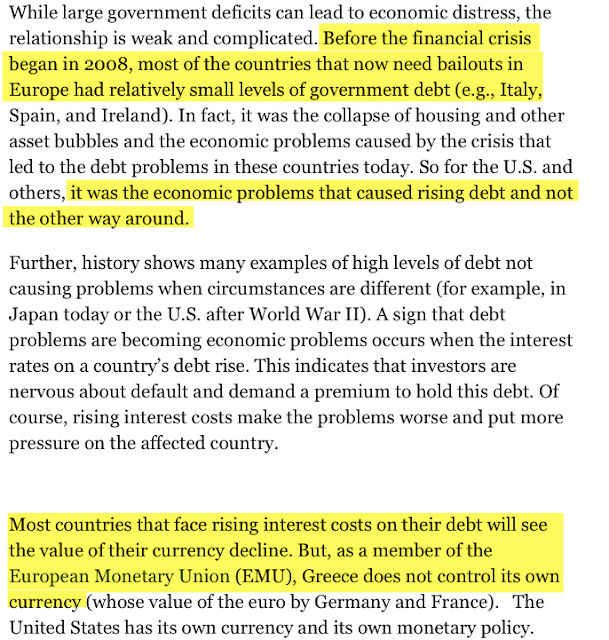 And, as part of the Euro area, Greek monetary policy is not independent but instead set in Frankfurt (quote from Forbes; full article referenced below). 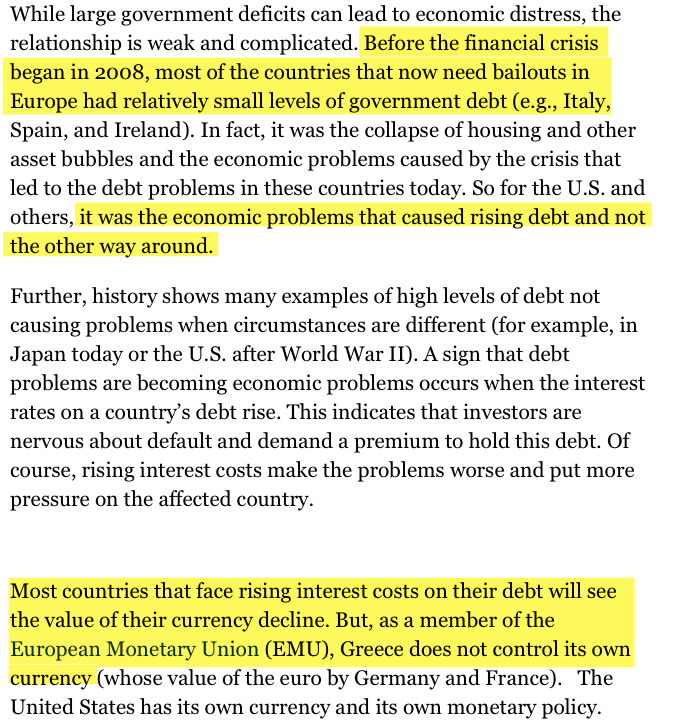 Primarily for these reasons, the Greek economy collapsed, falling by 25% in the next several years. The reduction in the denominator pushed the Greek debt/GDP ratio to 180% during the crisis; fearing default, 10-year bond yields rose to more than 30%, further chocking demand. 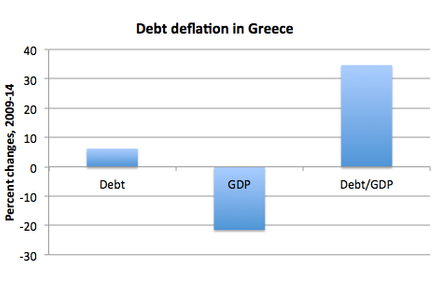 In short, the absence of its own currency and fiscal or monetary autonomy make Greece nothing like the US. Two very good summaries on all of this can be found here and here (chart from NYT). Let's now turn to household (consumer) debt. In many ways, this might be the most important potential source of economic risk. The US is a consumer-based economy. Consumer spending makes up nearly 70% of total GDP; this is 4 times larger than either government spending or business spending. So, a healthy consumer balance sheet is fundamental to a healthy economy (chart from JPM). The key point with respect to household debt is this: while federal debt has grown, household debt has fallen in the aftermath of the Great Recession. Households have deleveraged. This, in part, explains why the recovery has been slower than prior expansion cycles. Expansions are almost always accompanied by consumption funded by increasing household debt. This one has not. Household debt per capita is now at the same level as in 2Q2004 (first chart above). This was early on in the cycle's expansion. Like federal debt, the best way to measure household leverage is the ability of (a) income to cover interest and (b) assets or equity to cover liabilities. With both interest rates and debt levels declining while incomes are rising, it should not be surprising that interest coverage is comfortable. In fact, debt servicing is at a 4 decade low (chart from JPM). 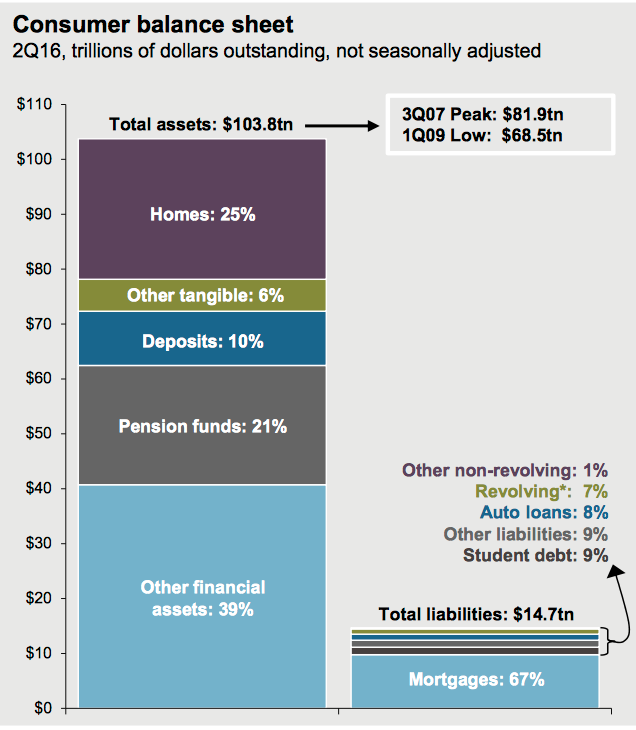 Household assets are now roughly 7 times larger than total liabilities. Even if asset values were to return to the lows of 2009, coverage would be nearly 5 times current liabilities (chart from JPM). Households' debt relative to their net worth (i.e., assets net of liabilities, or equity) is as low as in 1988, early on in an expansion cycle that lasted another 12 years before encountering its first major disruption. With leverage so low, it should be of little surprise that consumer loan delinquency rates are at multi-decade lows and falling. It would be reasonable to expect delinquency rates to rise to nearly twice current rates before the current expansion ends. Consumer loans that are severely late are at 9-year lows and loans that are current are at 9-year highs. Both are moving in a favorable direction. 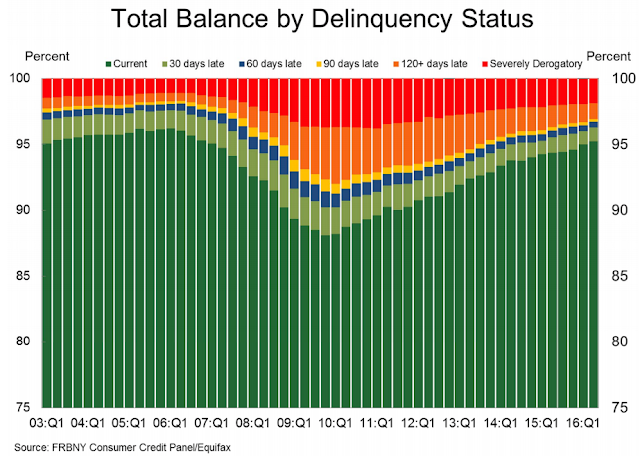 There is little evidence of consumers failing to meet their debt obligations (chart from Calculated Risk). In summary, it is hard to see the case for consumer debt being a worrisome risk at present. In fact, the current multi-decade lows in consumer leverage and loan delinquencies are typical of the early stages of an economic expansion. Given the importance of consumer spending to overall economic growth, current debt levels are likely more of a tailwind for the economy than an impending risk. 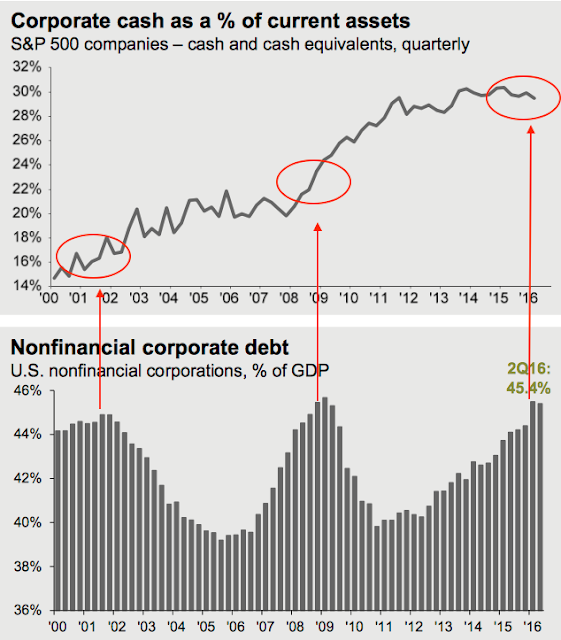 Finally, let's look at corporate debt. There is a good chance that you have seen a picture of corporate debt like this one. Corporate debt has nearly doubled in the past 10 years. The curve looks parabolic. By using a linear scale over 6 decades, these pictures are made to look frightening. In fact, the rate of growth in corporate debt has declined. Corporate debt may have nearly doubled in the past decade, but it tripled in the 1990s and more than tripled in the 1980s. Here's the same picture corrected by using a log scale. Note the decline in slope over the past decade relative to the period from the 1960s to 2000. It is accurate to say that leverage in the corporate sector has increased in the past 4 decades. Companies did not use much debt prior to the 1980s, due to less developed debt markets and higher interest rates. But most of the subsequent change in corporate leverage had already taken place by the early 1990s. Since then, leverage has largely stabilized. Corporate leverage today is not materially different than in 1994 or 2004, i.e., early in two expansion cycles. More to the point, it is hard to say that corporate leverage is excessive. In the chart above, corporate net worth (i.e., assets net of liabilities, or equity) is about 4 times larger than debt. That is not onerous coverage. Interest coverage is also not onerous. Companies in the Russell 1000 (which covers 90% of total US market capitalization) can cover interest costs 6 times with earnings. This is more comfortable interest coverage than companies enjoyed at any time in the 1980s and 1990s (chart from FactSet). The delinquency rate on corporate loans reached an all-time low in early 2015. Rates have since creeped slightly higher but are still just 1.6%, lower than at any time prior to 2005. Corporations are not finding it difficult to meet their financial obligations. Since early 2015, delinquency rates have moved slightly higher and interest coverage has moved slightly lower (prior two charts). Why? Energy prices fell by a massive 70% between late 2014 and 1Q2016. 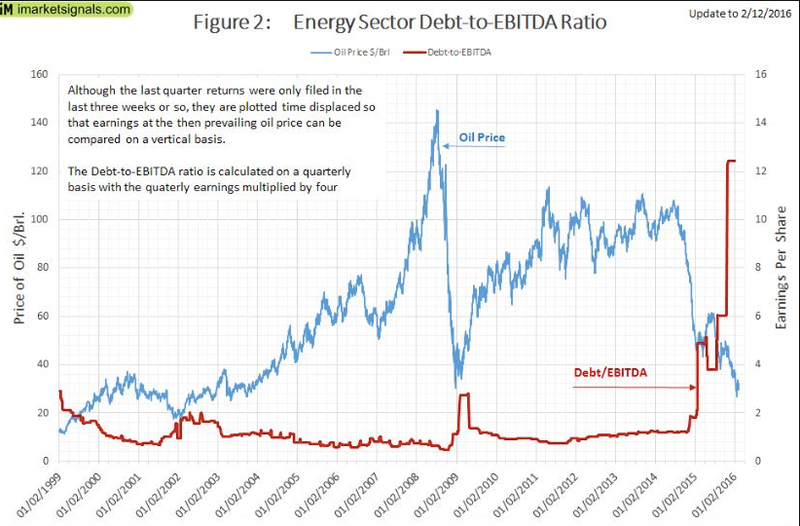 As a result, debt relative to income (EBITDA) in the energy sector went from under to 2 to more than 12 as earnings evaporated with the drop in oil prices (chart from Market Signals). Energy companies are likely the main culprit behind the small rise in delinquencies and fall in interest coverage. Still, monitoring both of these in the months ahead is prudent. The energy sector is also the main culprit behind the overall rise in non-financial net debt to income. 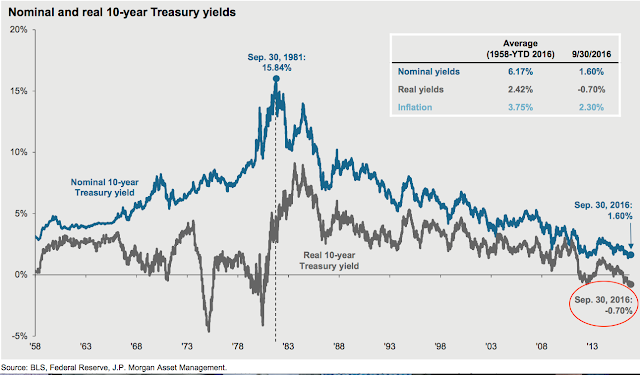 On this measure, current leverage is still about half that of the late 1990s and amongst the lowest in the past 5 decades (chart from DB). A popular way to measure relative corporate debt is to compare it to GDP. There are many problems with this. GDP is national output, so this ratio tells you nothing about the ability of corporations to cover either interest expense or the value of liabilities. About half of the sales of the companies in the S&P are now derived outside the US. The importance of ex-US sales is growing, so looking only at US GDP increasingly overstates leverage with time. Company profit margins have roughly doubled since the 1980s making coverage easier. So, again, GDP increasingly overstates leverage with time. Debt should be looked at on a net cash basis; this is material as cash levels have risen dramatically in the current cycle relative to prior ones. One more time: a GDP-based ratio will increasingly overstate leverage with time (chart from JPM). One of the current memes on US corporates is that they have used debt to fund share buybacks and artificially boost earnings per share growth. The logic goes that if companies have no more debt capacity then they will buyback fewer shares and EPS growth will fall. This is plainly wrong. 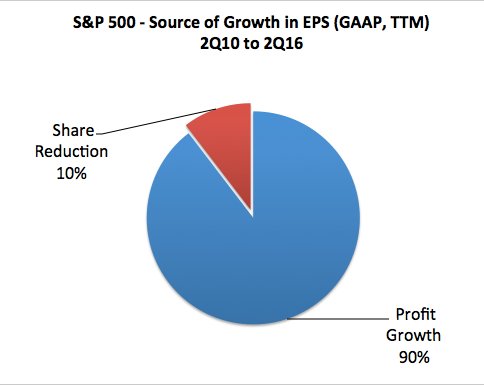 Since 2010, 90% of EPS growth has come from rising profits; share reductions account for just 10% of EPS growth (data from S&P). In summary, US corporate debt has risen, but so have assets and profitability. Corporate leverage is not materially different now than either 10 or 20 years ago. 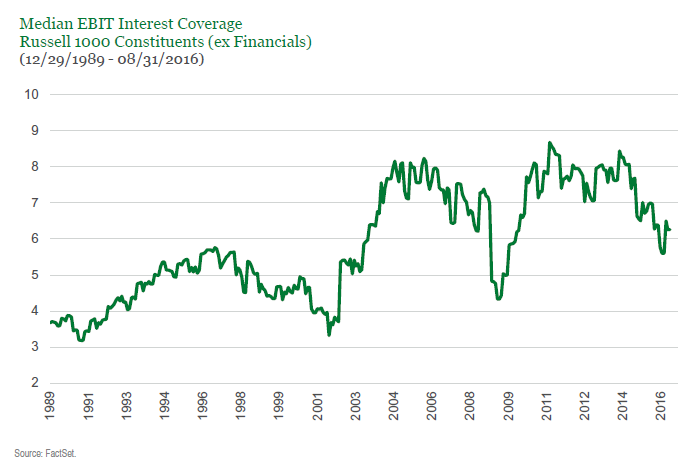 Interest coverage is better than at any time in the 1980s or 1990s. There are no significant signs of stress in corporate loans, indicating that companies are not having difficulty meeting their obligations. Like federal debt, there is a natural human desire to prefer lower corporate debt, leaving more headroom to fund future growth. 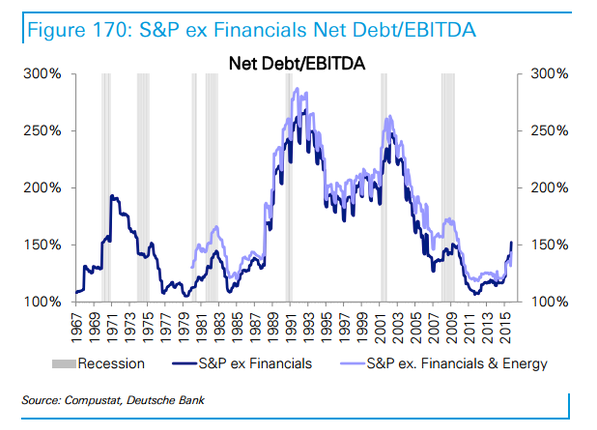 But, objectively, it is hard to see the case for current corporate debt being a worrisome risk at present. A better place to look for end-of-cycle risk from corporations is in their profitability. As expansion cycles mature, labor costs rise and corporate margins peak and then decline (arrows). To us, this is a more acute concern than leverage. The wild card, again, is likely to be the relative health of consumer balance sheets, as this argues for a longer than normal expansion (chart from JPM). In summary, investors have become very concerned about excessive debt in the US. The worry is that current leverage has risen so rapidly and become so extreme that the economy is at imminent risk of a crisis. This post looked at each component of US debt. We find that the rise in US debt is primarily due to the federal government and corporates. Objectively, it is hard to see the case for either being a worrisome risk at present, as their liabilities and interest expenses can be covered many times over by assets and income. Moreover, households have deleveraged during the current cycle. This is quite unlike other periods of economic expansion. Given the importance of consumer spending to overall economic growth, current consumer debt levels are likely to be more of a tailwind for the economy than an impending risk.